Breakfast at your hotel (possibly a Victorian Bed and Breakfast) or in one of the many restaurants serving hot, full meals to get you started. Learn about “The Chincoteague Story” through a historic walking/biking tour of the island. Explore the island’s many neighborhoods and visit the historic buildings in Historic Downtown and beyond. Tour maps available at Chamber office – 6733 Maddox Boulevard. Visit the Assateague Lighthouse, built in 1867, and enjoy a walk on the beach to see the old Coast Guard Life Saving Station at the southern end of Assateague Island. Picnic at one of our beautiful waterfront parks with a boxed lunch from one of our many fabulous eateries. If weather is not permitting, enjoy indoor dining at one of our wonderful restaurants. Visit the Captain Timothy Hill House, the oldest house on Chincoteague Island; circa 1800. Now a historic house museum, guests are always welcome to visit with public tours available during summer hours. Take a step back in time with a visit to the Museum of Chincoteague Island. 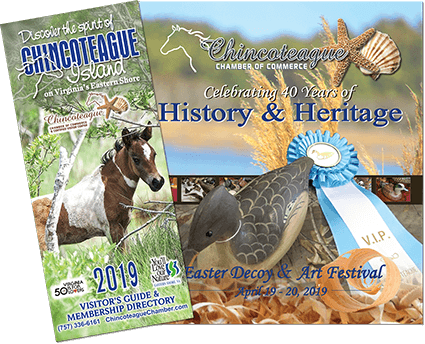 Learn about the island’s rich history and traditions through various exhibits showcasing decoy carving, Misty, oyster industry, farming, and more. Hop aboard a boat cruise and sail around Chincoteague Island while learning more about the history of Chincoteague and Assateague Islands from knowledgeable boat captains. Dine at one of our fine restaurants feasting on fresh from the waters, clams, world-famous Chincoteague Oysters, and the “catch of the day” which could be red drum, flounder, rockfish, or tuna. Learn about the history of Misty of Chincoteague with a visit to Miss Molly’s Inn Bed & Breakfast where Marguerite Henry wrote the world famous children’s book in 1947 and art deco Island Theatre, circa 1945, to view Misty’s hoofprints which were cast in concrete at the movie premiere of Misty in 1961. Enjoy a self-guided tour of “All Things Misty”. Talk with a local carver to learn about the rich history and traditions of decoy carving. Shop for treasures while you stroll down Historic Main Street, with many buildings built in the 1920’s, or in one of the several antique stores on the island. Be sure to purchase a copy ofHidden Galleon: The True Story of a Lost Spanish Ship and the Legendary Wild Horses of Assateague Island to learn more about the legendary Spanish shipwreck and how the ancestors of today’s Chincoteague Ponies arrived on Assateague Island. Complete your day with an ice cream sundae at one of our ice cream parlors.